In August 2018, SE University welcomed Donald Meinheit, PhD, PE, SE, from Wiss, Janney, Elstner Associates, Inc., to present Behavior and Design of Anchors in Concrete. Don has chosen to split his donation between Purdue University Lyles School of Civil Engineering Undergraduate Structures Laboratory – Hampton Hall Renovations (https://engineering.purdue.edu/CE), University of Illinois – Urbana-Champaign Civil and Environmental Engineering Trust Fund (https://cee.illinois.edu/give/cee-trust), and the University of Texas at Austin Jack Breen and Phil Ferguson Endowment Funds and the James and Marion Jirsa Endowed Excellence Fund (http://www.caee.utexas.edu/alumni/gift/opportunites) for the SEU Speaker Inspires donation of the month. 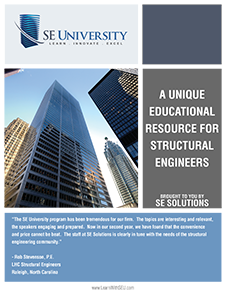 Thank you, Don, for helping structural engineers with your SE University session, and for your designation of Purdue University Lyles School of Civil Engineering Undergraduate Structures Laboratory – Hampton Hall Renovations, University of Illinois – Urbana-Champaign CEE Trust Fund, and University of Texas at Austin Jack Breen and Phil Ferguson Endowment Funds and the James and Marion Jirsa Endowed Excellence Fund, as our SEU Speaker Inspires Organizations of the Month! **UPDATED 10/18/2018 – This post was updated to redirect funds to the Purdue Undergraduate Structures Laboratory – Hampton Hall Renovations and to include the James and Marion Jirsa Endowed Excellence Fund at the University of Texas at Austin.